Why you need this product ? A formal and ISO/IEC 27001 certified management system for Information Security has become very important in today�s business environment. Both the customers and suppliers are becoming more concerned about the safeguards you have put in place to protect customer data, technical know-how, online transactions, etc. It is not just the IT/ITES companies, but virtually every service and manufacturing organisation needs some level of information security. Any organization can implement an Information Security Management System (ISMS) as per ISO/IEC 27001:2013 and get certified. Before inviting a reputed third party certification body for audits and certification, your organization must prepare the ISMS documents (policy manual, system procedures, forms, etc. ), impart training to employees, implement the ISMS for sufficient period of time, and conduct internal audits and management reviews. Improper planning and non-completion of documentation are the major reasons for delays in ISO/IEC 27001 certification projects. 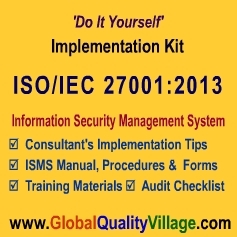 Implementers often lack the know-how of ISO/IEC 27001:2013 documentation and implementation. It is also a fact that just reading text books (or the ISO/IEC 27001 standard itself) may not result in proper documentation and time-bound execution of an ISO/IEC 27001 certification project. What you need is a worked-out example of Information Security documentation (policy manual, system procedures, forms, etc. ), and down-to-earth guidance for practical implementation of an ISMS. Our product has all these qualities. This kit is also a hot favourite of management consultants who plan to start ISO/IEC 27001:2013 consultancy. What is included in the kit ? This unique DIY (do-it-yourself) kit consists of Implementation Guidelines, Sample Documents, Training Materials, and Internal Audit Checklist. 1. Implementation Guidelines: Our management consultants have vast experience in successfully implementing ISO/IEC 27001:2013 Information Security Management System in various organisations. On the basis of their experience, our consultants have prepared a step-by-step system implementation guideline that provides clear directions to managers (management representatives) who would plan and implement the system. Following these guidelines could help cut down the cost and duration of your ISO/IEC 27001 project substantially. 2. Sample Documents: These Word / Excel templates include fully developed Policy Manual, System Procedures, and Forms. We have also included a detailed document customisation guideline (in PDF format). Written in simple English, you can customise the document templates easily to suit your ISO/IEC 27001:2013 requirements. You can retain 75% text as it is, and need to modify only 25% by putting in your company-specific content. The 30 standard forms (blank) included in this kit can be used with very minimal changes. 3. Training Materials: This kit also includes two self-learning / in-house training material in PDF format (one on ISO/IEC 27001:2013 standard, and the other on internal auditing). 4. Internal Audit Checklist: Finally, there is an exhaustive audit checklist (ISO/IEC 27001:2013 clause-wise, very similar to the checklists used by auditing agencies) which you can use for initial gap analysis as well as routine internal audits. This kit is suitable for both manufacturing and service organizations. If you want to evaluate sample documents before purchase, please Click Here to send us an online request right now. Please do not forget to mention the product name. We shall send you the sample documents (zip file) by email. Please click here to visit our e-Shop and place order now. You can either make an instant payment online (Credit Card / Debit Card / PayPal / eCheck / Internet Banking) or generate a Proforma Invoice and make payment off-line (Bank Demand Draft / Check) within 30 days. In case of download version, you can download the kit from our website within six hours of making the payment. (Files compressed in WinZip format, takes just 5 minutes to download). We can also send the zipped file as email attachment, if required. Price of CD-ROM version is inclusive of shipping charges. Product CD shall reach you within 7 days (India) or within 10 to 20 days (other countries) of receiving the payment. Copyright � 2017 Sirwill Software Private Limited, India. All rights reserved.